This section is dedicated to showcasing and explaining the technology behind NUUO's award winning products & solutions. Read on NUUO Technical Quarterly to find out how NUUO solves many of these surveillance problems with ingenious technology! NUUO is the open platform leader in software-centric video solutions. We innovate to answer the need for sophisticated yet simple to use surveillance products. With solutions designed for every vertical industry, we have crafted an exciting array of products suitable for any surveillance needs. Our products offer unmatched flexibility from combining open platform and open standards, yet remain feature rich and highly customizable. With a growing list of 1800 compatible cameras, NUUO leads the market with excellent camera compatibility and analog/IP camera integration. 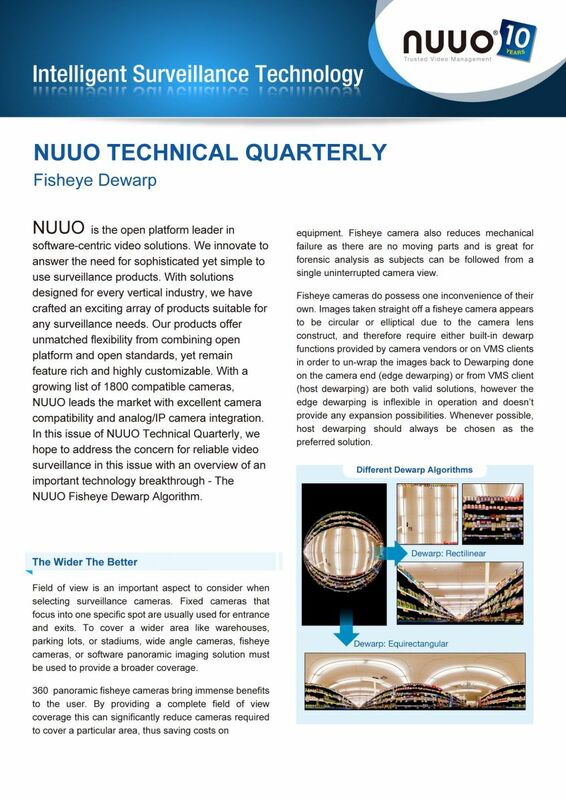 In this issue of NUUO Technical Quarterly, we hope to address the concern for reliable video surveillance in this issue with an overview of an important technology breakthrough - The NUUO Fisheye Dewarp Algorithm.